Through the fascinating stories of 50 women from Afghanistan, Pakistan, India, Bangladesh, Nepal and Sri Lanka, South Asian girls will have a chance to dream about lives for themselves that radically differ from the limited narratives written for them by their culture, wider society and the media. 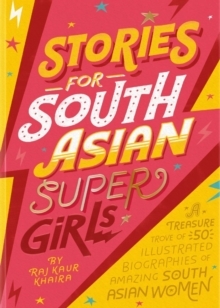 From a prominent suffragette (Sophia Duleep Singh) to the Indian princess who spied for Britain in World War II (Noor Inayat Khan) and a Booker Prize-winning author (Arundhati Roy), Stories for South Asian Supergirls seeks to redress the imbalance for young girls of colour by empowering them to break new ground for themselves and to inspire others in the process. Each biography is illustrated with a striking portrait by a team of talented female South Asian artists, making the book a collector's item in its own right. 100% of the author's share of proceeds from book sales will be donated to charity.